A documentary on the fabled recording studio Sound City. 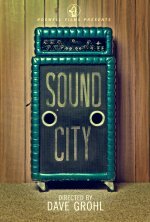 Sound City release date was Friday, February 1, 2013. This was a Limited in theaters release. Deep in the San Fernando Valley, amidst rows of dilapidated warehouses, was rock n' roll's best kept secret: Sound City. America's greatest unsung recording studio housed a one-of-a-kind console, and as its legend grew, seminal bands and artists such as Fleetwood Mac, Neil Young, Rick Springfield, Tom Petty, Metallica and Nirvana all came out to put magic to tape. 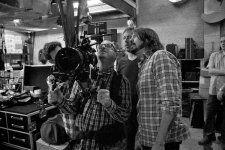 Directed by Dave Grohl (Nirvana, Foo Fighters) and featuring interviews and performances from the iconic musicians who recorded some of rock’s greatest albums at the studio, Sound City doesn’t just tell the story of this real-life rock ’n’ roll shrine, it celebrates the human element of music as Grohl gathers some of rock's biggest artists to collaborate on a new album. Roswell Films, a division of the Roswell Records label that releases Foo Fighters music, will distribute the film.